When I was small, my mother was a dab hand on the sewing machine – I remember her making me pretty summer dresses, all the curtains in our house and party dresses for herself, and I don’t think this was particularly unusual. I was allowed to turn the handle on the old Singer sewing machine while my mum guided the fabric through. And when a needle snapped I was allowed to replace the broken one with a new shiny silver needle. When we moved to our current house 12 years ago we visited Forge Mill Needle Museum, where I learned that 90 per cent of the world’s needles used to be produced in Redditch – right on our doorstep. Now that many clothes are cheap enough to wear a couple of times and then throw away, the art of using the sewing machine to “run up” clothing has largely been lost, in spite of programmes like The Great British Sewing Bee. The group that I am writing about are big users of all sorts of sewing needles. 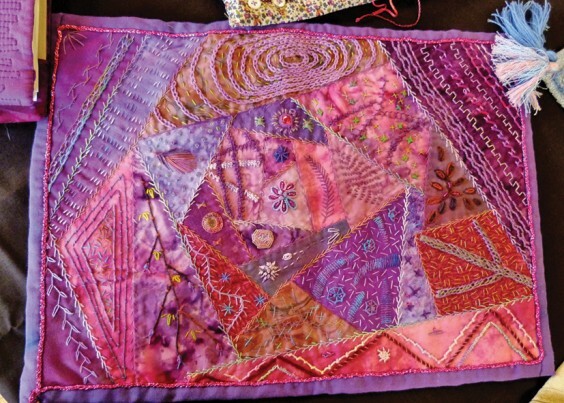 They started meeting at Forge Mill back in 1989 when the Museum ran a couple of summer schools, where participants experimented with machine and hand embroidery, applique, patchwork and quilting as well as batik and dyes. Afterwards a group of keen textilers was formed and regular group meetings took place every week in the cottage attached to the museum. This same group, now known as Forge Mill Textiles Group, had their first exhibition at Forge Mill in 1990 and have retained strong connections with the Museum, in spite of moving their weekly meetings to Beoley Village Hall. They continue to hold annual exhibitions at the museum. Several visitors, myself included, attended when they held an Open Day back in November at Beoley Village Hall. An exciting and busy scene met our eyes as we entered. Janet Wright was using a plastic material which was worked into, dyed and then shrunk, offering lots of creative possibilities. Carol Smith was demonstrating machine embroidery and had her stunning handbags on show. Rita Weston was using printing, stencilling and Markal Paintsticks to pattern and colour fabrics. Janet Carpenter used ready-mixed poster paints to play with colour effects as well as stamps to print with. Joy Johnson was using a sewing machine to make an unusual textile bowl from piping cord covered in pretty fabric. Sheila Nunnerley was machining dissolvable fabric with brightly coloured threads ready to turn into a Christmas card. Away from the sewing machines and splodgey dyes and paints were Eileen Rockcliffe, Jill Gallagher, Muriel Pain, Rita Wilson and several others, sitting at a craft table and working on a variety of beautiful hand-stitch projects such as patchwork creation, canvas work and hand embroidery. It really was all going on, in a chatty, coffee and cake, textiles way. Maybe you have a love of textiles and have been wanting to join a group with creativity, skills and ideas. The Forge Mill Textiles Group is hoping to expand its membership, so why not join them? 2015 could be the year that you finally join a local group, enabling you to develop your creativity while meeting like-minded individuals in a relaxed and warm environment. Call Sheila on 0121 445 2238 or Lynda on 0121 445 3212.